Aloha. My name is Jesse Yonover and I co-founded Huli with Austin Kino. Austin and I grew up surfing, diving, fishing, paddling, and sailing in Maunalua Bay. We started Huli as a way to give back to the youth in our community. We felt that the bay was such a special part of the natural environment of the region and it was important to get the local students more involved with the stewardship of this resource, especially in an educational setting. Huli is an ocean based environmental education company that provides field days in Maunalua Bay for surrounding public school students from K-12. To date, we have worked with hundreds of students from schools like Kaiser, Hahaione, Niu Valley, and Malama Honua Learning Center. 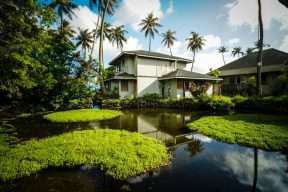 This is the 2nd year we have been in business thanks to grant funding from Olukai and Patagonia. Most of our field days are based out of Paikō Wildlife Sanctuary where students study the water quality of the bay, remove invasive species and plant natives, learn about the Hawaiian Star Compass, and even paddle and sail in traditional Hawaiian canoes. The general idea is to nurture and strengthen the relationship that these students have with the ocean in their own backyard, with the ultimate goal to have them more knowledgeable and involved in conserving these resources. Our excellent partners who helped us get programming off the ground include the Department of Forestry and Wildlife, Kahi Kai, Hui Nalu, Maunalua Fishpond Heritage Center, and of course KUA. This year we are excited to continue the Maunalua Junior Konohiki program that is the foundation of our company and we are also expanding programs to include the Maunalua Future Navigators program. 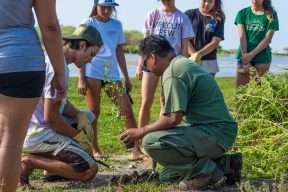 While the Maunalua Junior Konohiki program brings large classes or even entire grades into the bay for field days, the Maunalua Future Navigators program will foster a small group of passionate high school students over the course of multiple field days. 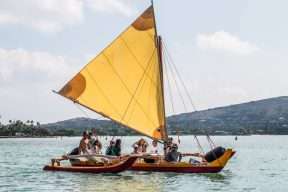 This program will teach them to sail traditional Hawaiian sailing canoes and the traditional art of way finding, and will also involve them more deeply in the different conservation efforts of our community partners. We are excited for what the future holds and hope that our efforts will make lasting change within the bay and the community. For more information we encourage you to take a look at our website and watch our most recent film piece: The Future Is In Our Hands. We want to send a special Mahalo to KUA for constantly supporting our organization. See you in the water!